Running a growing and sustainable business (and even a blog) is hardly a solo gig. Whether you’re managing a virtual team from your bedroom, working with a distributed team in offices around the globe, or working in an office with multiple teams and departments, team collaboration is so important, because it is the foundation for creating a company infused with a culture of growth from the ground up. 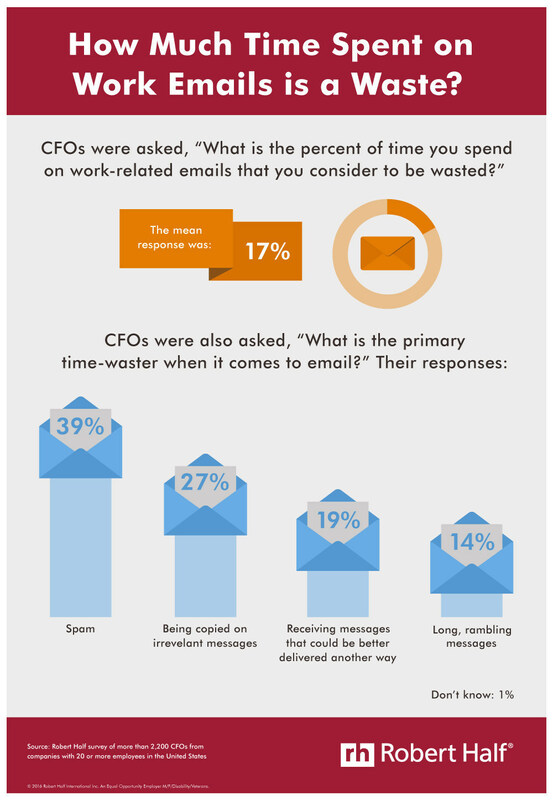 Jonathan Yabut and Wyatt Ong of Rappler recently debated the politics of office emails on The Cube podcast, which brought back fond memories of the times people completely ignored my emails. Even better were the times people would email a document out to multiple reviewers, and each person would make changes on his or her own copy of the document. Then, all the different documents would have to be collected and all the comments had to be integrated into a single, final document – which was then sent out to a new team of multiple reviewers. This process was perfect for quintupling the amount of time it took to get anything through review. And who could forget those lost weekends and evenings making changes to a document only to find out that it wasn’t the latest version? Fortunately, these days we have a host of online collaboration tools designed to actually streamline our work processes and make it easy for us to communicate effectively. 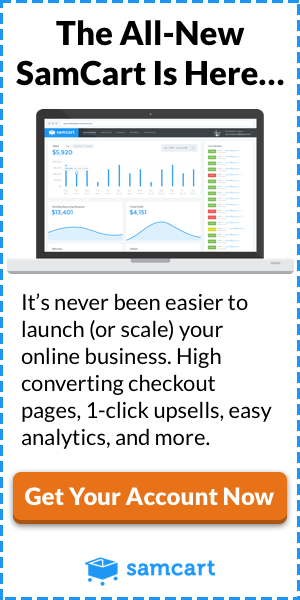 Here’s a look at some of the tools we use at IN THE KNOW, how they help our processes, and how they can help yours, too. If you know me, you know I’m a big believer in getting your processes right. Sometimes, that means you need to experiment with the flow to get it just right, and sometimes, it’s more about executing effectively. Trello is an online collaboration tool that you can use to organize your entire business for at-a-glance access to what’s happening, who is doing what, and what needs to happen next for any project or process. With Trello, you add cards to lists within project boards, and each card can be filled with incredible amounts of detail. You can organize your digital workflow with Trello or use it as a digital Kanban board – as well as to onboard new recruits and document workflows and checklists team members can access on the fly. Dana Kajtezovic of Vertical Measures also explains how to use Trello to create an efficient content marketing strategy. If you’ve never used Trello, Steve Dotto provides an excellent video overview on getting started. Because Trello is a visual system, it’s a little bit different from most task managers. 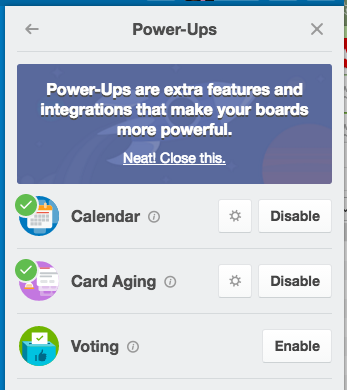 Another cool Trello feature? The Power-Ups features that you can add to your cards. From within a board, simply select Power-Ups from the menu on the right-hand side of your screen and enable the ones you want. The Calendar and Voting Power-Ups are handy, but the truly innovative Power-Up is Card Aging. When you enable Card Aging, a card that hasn’t been edited or moved, will start to fade and curl around the edges. This gives everyone a visual indication that some part of the process has broken down. Card Aging can help you quickly find the parts of your process where ownership isn’t clear, responsibilities aren’t being delegated effectively, or something simply isn’t working the way it’s supposed to work. You can use Trello for free – we do at IN THE KNOW – and the business plans offer additional collaboration tools for larger teams. While Trello works well for designing processes, Basecamp provides a streamlined project management experience that makes it simple to assign tasks, check items off lists, make quick decisions on multiple projects, and keep everyone on the same page, as Christopher Jan Benitez explains. You can easily share files and communicate with other team members, and you’ll probably find that Basecamp makes it easier to see the big picture and concentrate on what really matters: getting the work done. If you’re expecting to need a lot of real-time discussion on documents and tasks and the focus is on the communication, rather than on the flow, of a project, Basecamp is a smart choice. At IN THE KNOW, we use Basecamp to manage specific processes that we have locked down over time where the visual flow representation isn’t necessary – or could even be a hindrance. Basecamp lets us focus on getting things checked off efficiently – but it does cost money to use (although they do offer a 60-day free trial to let you figure out if the app is right for you). If you’re not sure whether Trello, Basecamp, or a combination of the two is best for your team, this video will walk you through both apps and show you some use cases. Whether your team is all located under a single roof or you’re collaborating with an international team, daily interaction is critical when you want to perfect team bonding. When you’re building a culture of growth in your business, you want to encourage your developers to talk to your designers, your customer support team to talk with marketing, and so on. There’s a reason Slack was recently valued at a smidge under $4 Billion: it’s a highly intuitive communication tool that combines simplicity with extreme searching power for maximum usability. Getting started with Slack is incredibly straightforward, and Steve Dotto will walk you through everything you need to know immediately. 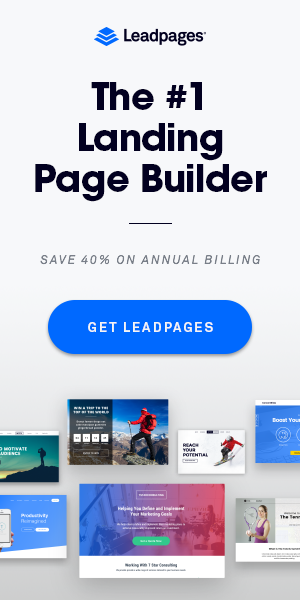 The freemium product may not be absolutely unlimited, but it will almost certainly meet the needs of any startup or small business for real-time chat, document and image sharing, and more. Designate separate channels for distinct projects, have private conversations with your executive team, and send direct messages as needed – it’s all visible and highly searchable, which makes it a powerful tool to improve your workflow. Slack’s integrations are what take it from useful to indispensable. Drive, Dropbox, Zendesk – you can hook Slack up to just about every tool you’re using for real-time notifications and streamlined, searchable actions that your team can discuss and act on from wherever they are. Tech Republic’s Nick Heath put together a list of user-generated tips on the best ways to use Slack for business. Used correctly, Slack can even eliminate email within your organization for truly streamlined online collaboration – although Andre Spicer says that doing so wouldn’t necessarily make you happy. Did I mention that Slack is highly searchable? Put that search feature to work for you and never, ever lose a file – or a message – again. 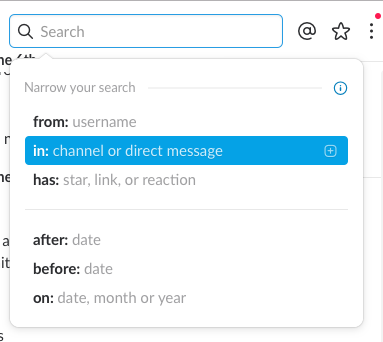 You can search for messages within a specific channel, from a specific user, with a specific emoji, from specific dates, and much more. Click the plus sign (+) next to any modifier to reveal additional search properties, which make it incredibly easy to find what you need almost instantly. Here’s a quick video from Francesco D’Alessio to show you how to use Slack’s new reminder feature – a great way to make sure tasks don’t slip through the cracks. Voxer calls itself a live messaging app that brings push-to-talk technology to smartphones. I know, I know, you’re going, Push to talk? Wasn’t that a thing, like, 15 years ago? Yeah, but this is different – and better. If you’ve used iMessage or WhatsApp or any other messaging app, you already know the basics. You can send unlimited text and voice messages, images, and videos to individuals or groups. But with Voxer, messages you record are available for the recipient to listen to while you are still recording them. And even if you listen to a message live, it’s still recorded, so you can hear it again later. And as Brady Dale points out, Voxer eliminates the need for small talk, which makes it ideal for giving instructions, explaining things that get confusing over email, or just adding a personal touch to a quick congratulatory message for a job well done. Either way, Voxer is a fantastic communication tool. IN THE KNOW has remote team members in vastly different time zones. Voxer helps us create a cohesive virtual culture by letting us record messages that would be ridiculously complicated to send by email – for example, instructions on which pages of the site need to be updated with what, feedback on graphics, notes on logging into various team accounts, and so on. The free version of Voxer works fine for our team right now whereas pro features are available for a monthly subscription fee. Beyond everyday communication and managing projects, we need online collaboration tools that let us actually get the nitty-gritty work done. If you’re looking for ways to work on documents and images with multiple team members, these tools will be invaluable. You’ve undoubtedly discovered Google Drive, along with Docs and the rest of the Google apps, but are you taking advantage of all they can offer? The team at IN THE KNOW uses Google Drive and its apps to maintain all kinds of live documents that we know multiple people will need to update regularly. Google allows multiple users to work on documents simultaneously, which makes it ideal for collaborating and completely eliminates versioning control issues. You can add comments, resolve them, and maintain a running list of notes to keep everyone on the team in the loop, and a single file can live in multiple folders simultaneously through some strange form of magic, like parallel lines meeting at infinity. And if something somehow does go wrong, the Revision History panel lets you roll back the clock and reverse any changes that shouldn’t have been made. 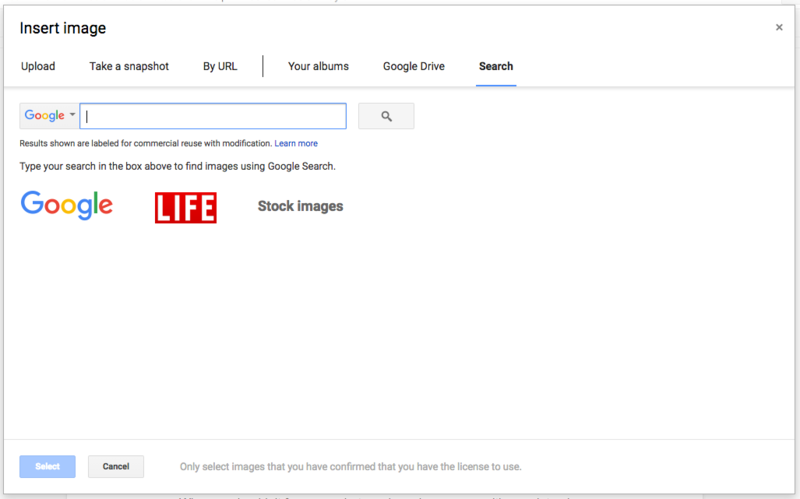 One of my favorite time-savers is searching for images from within Google Docs (and any other Google app). After opening your doc, just choose Insert –> Image and then click the search button to bring up this handy window. In addition, Google recently added a new feature – you can now insert charts and update them with a single click. Sethi De Clercq of Flipped Classroom explains how. The Google apps are significantly better than their Microsoft counterpoints when it comes to real-time collaboration, although Office does have the edge in a few areas (formatting very large documents and manipulating data in Excel, for example). Dropbox is another app you’re undoubtedly familiar with already, but are you getting everything you can from it? For example, have you ever used the Dropbox file preview tool? Let’s say you want feedback on a graphic you’re creating in Adobe Illustrator (AI). It’s likely that at least a few of your team members don’t have AI installed. File preview to the rescue: Anyone with a browser can see your file without downloading it locally. Dropbox has so much functionality and Rachel Kaser at MakeUseOf.com has written an informative post on 10 Dropbox Tools For the Creative Geek. To streamline my own workflow, I create a shared folder with each of the primary members of my team. Instead of sending files as attachments, the major files we need to access live in these shared folders. I don’t recommend this for files that are constantly being edited and updated – for those I prefer Google Drive. Dropbox is still too prone to issues with conflicted copies when multiple people work on a single document, so it’s better to keep a single copy online and get in the habit of closing it when you’re finished with your work. Upgrade to a business account for more storage space and advanced features – it’s inexpensive, and you’ll never have to worry about running out of space. For 2016, Dropbox is pushing its newest project, Dropbox Paper. The video offers a quick overview. Live inline video is definitely a nice touch, and with enough integrations, Paper might finally be a true competitor to Google Docs. When you’re collaborating on design-heavy projects, you need specialized tools, and I’m a huge fan of InVision. Created specifically for designers who need to tap into the creative power of collaboration, InVision lets you share fully active prototypes – complete with gestures, animations, transitions, and live comments. Integrated to-do lists keep projects on track, and the app makes it easy for anyone to offer feedback or suggestions on a design. With the release of Library, Invision has introduced cloud-connected assets that automatically update across your organization. Even with all the online collaboration tools that abound, it’s sometimes difficult to collaborate without meetings. And whether you run a remote team or you’re all just working from home today, sometimes you can’t all sit down in the same room. In some ways, Skype has come a long way from the early days of choppy video and random disconnects. In other ways… well, frankly, there’s still a lot of choppy video and random disconnects – but that’s true of every consumer-level video app. Still, screen sharing, video and audio calls, as well as an instant messaging feature make Skype a truly useful business tool. Group video calls can still be a little sticky, but group audio is generally high quality, which makes it easy to hold meetings with multiple team members. For those who want to play around with the less well-known features of Skype, Freemake.com has an updated post on the top secret Skype features. Our remote team uses Appear.In for many of our staff meetings. One person sets up a room (no download or account registration required) and sends the link out to everyone; clicking the link puts up to 8 people in a room for video chat with integrated chat and screen sharing. You can choose to enter an email address if you want to claim a room, which prevents others from taking your room name and gives you some minor customization options. If you’ve never tried Appear.In, Jen Lehner walks you through exactly how easy it use to use and integrate into your workflow. 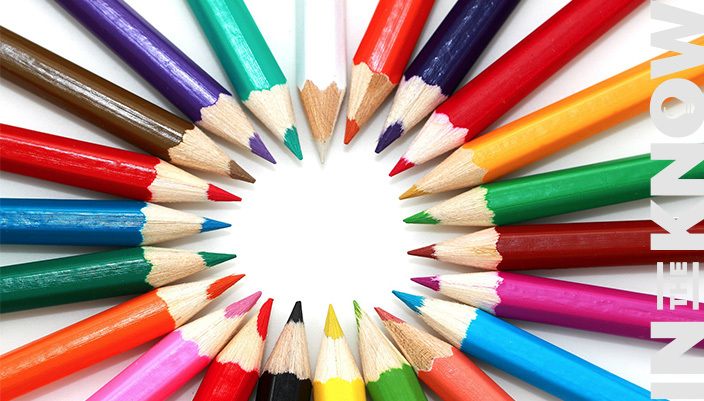 It’s hard to definitively state which are the best online collaboration tools – much depends on your particular needs, the size of your team, and so on. It’s a lot of fun to explore new tools, and it definitely feels like valuable work – but don’t fall into the trap of letting that exploration replace the actual work you need to do. In other words, don’t spend so much time working in your business that you forget to work on your business. Don’t revamp your workflow to accommodate a fun new tool just because everyone else is using it and it looks really cool. Rather, focus on choosing tools that will truly streamline your workflow and improve it where possible. Let me know if you’re using any of these tools – or what you recommend instead. I’d love to hear what’s helping you with your business growth! You have given a great list of collaboration tools.Here I want to recommend Microsoft’s SharePoint one of the best online collaboration tool in the market. SharePoint offers many good features for document management, task management, blogging, team management and more. Thanks for great share Buckley. Nowadays from a small company to enterprise everybody needs a Task management tool because members must be able to communicate, collaborate, and share ideas with efficiency & ease hence it will improve the productivity of existing teams and employees.This is a huge list of project management collaboration tools. I would like to recommend checking out Interval, a project management app with a focus on time tracking and task management. One more very good online collaboration tool which you may add in the above list is: R-HUB web conferencing servers. It is an on premise solution which works on all platforms viz Windows, MAC, Android, iOS etc. Good to know! Will check it out. Thanks for helping gather this fantastic information about Online Collaboration Tools. Good to be here and to know something new and essential.